Vegas is the place to Party! Why be limited to a hotel room or a nightclub to let loose with your friends? Take the party on the road with MW Travel’s Party Bus! We provide you with your very own party on wheels or merely a way to keep the party going between destinations without any concern of you getting behind the wheel yourself or worrying about your company. With comfortable couch seating that fits 20 people, we provide you Las Vegas party bus with a fully kitted entertainment experience where privacy is no problem. It really is the perfect option for a private party. It comes with a small fuel surcharge – but we will let you know the details so there are no surprises. Book for a minimum of two hours and we can stock the bar with the actual cost of adult beverages at your request and we will only charge a small fee for a half hour while you unwind and have fun. Plus, the party area is separate from the driver so you have plenty of privacy for you and your guests to be yourselves. Woo Hoo! – the Party is on! The good thing about our Las Vegas party buses is that we have several to accommodate you. 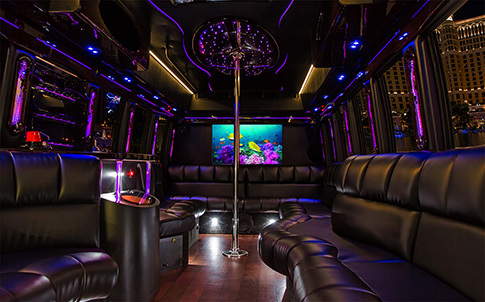 Our Las Vegas party bus is also not just for young adults wanting to have fun. When last did you and your friends just leave the kids and responsibilities at home and go out for a night on the town? Our Las Vegas Party Buses are for ALL adults. Whether you are in Vegas on business or for a holiday, a party bus is an unusual, safe but incredible experience. If you are a local then book us for your next birthday, anniversary or work promotion. To Rent a Las Vegas Party Bus Call Us NOW! Dont procrastinate. Give us that call or treat that special person in your life on their birthday - or do it just because you can. While you are busy planning your next function, consider our additional services such as hotel rooms, show and concert tickets, great drink packages and free transportation to gentlemen's clubs. Just one call to us and book our Las Vegas party bus with in your budget. Call now!